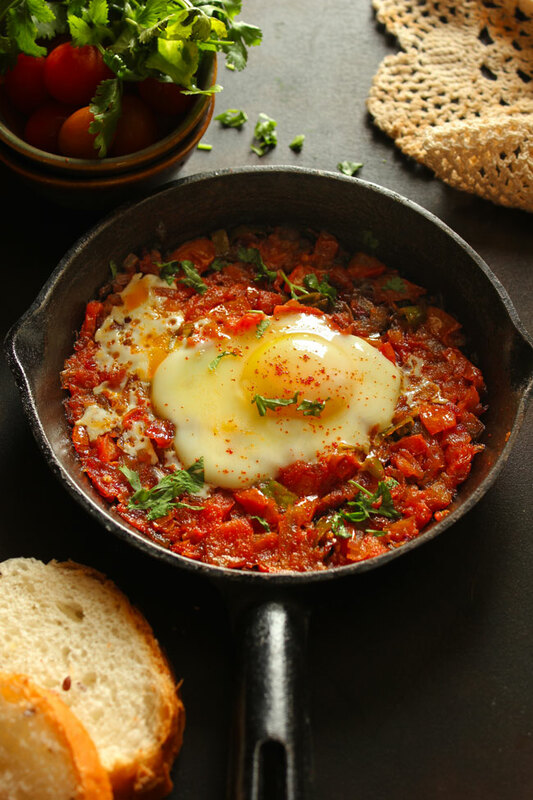 Indian Style Shakshuka Recipe is a delicious twist to the traditional shakshuka. Little pockets of eggs served on a thick tomato and pepper sauce is the perfect combination for breakfast. It is spicy, tangy and saucy – the best of all flavors right in one plate. Serve shakshuka straight from the pan or dig in with the chunks of soft bread. The simplicity of this dish also is its biggest selling point – local flavors, good protein, and a nicely spiced base. 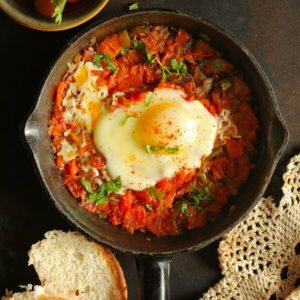 If you’ve never tried or heard of this Israeli breakfast dish, I highly urge you to try this shakshuka recipe. 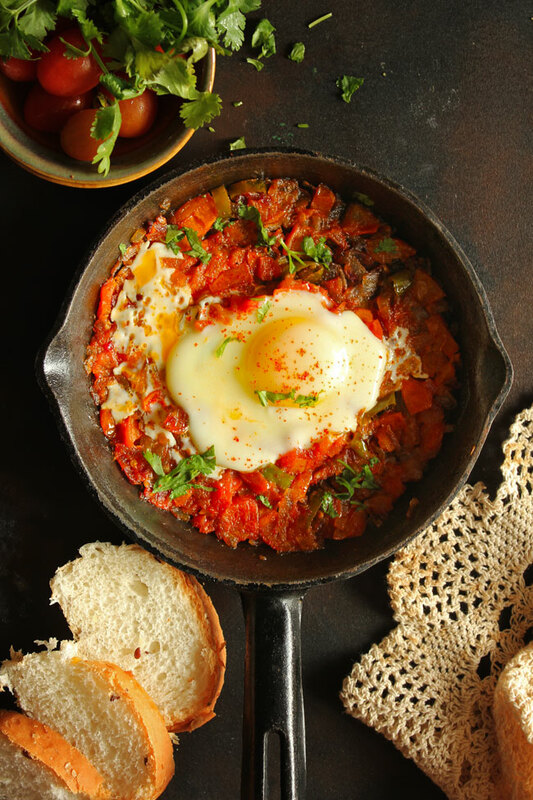 The whole premise of shakshuka is centered around the combination of tomatoes and eggs which are a perfect blend – the tanginess and juiciness of the tomatoes and the soft creaminess of the eggs are a match unlike any other. The tomato sauce is spiced with a hint of Indian spices and has small pockets of perfectly runny eggs. Other versions of the shakshuka recipe recommend adding more vegetables, minced meat or lean protein like chicken or even soft cheese to the dish. You can try it out with all the variations or sample this Indian style shakshuka recipe first, which I’ve written below for you. It can either be baked or cooked on a stovetop. 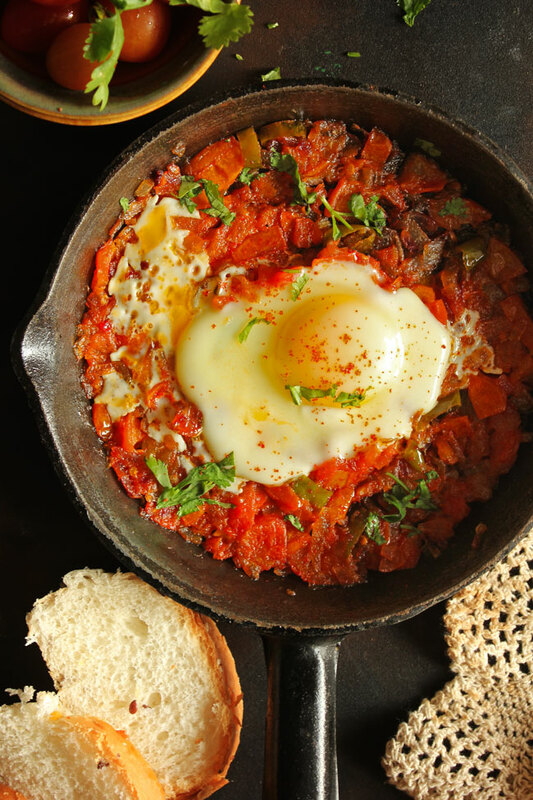 I recommend using a cast iron skillet for this shakshuka recipe or a heavy bottom non-stick pan. Shakshuka originated in Africa but later got recognition in Middle Eastern Cuisine. Today, Shakshuka is credited as an Israeli dish. There are many variations of shakshuka prepared in Middle Eastern and Mediterranean Cuisine. 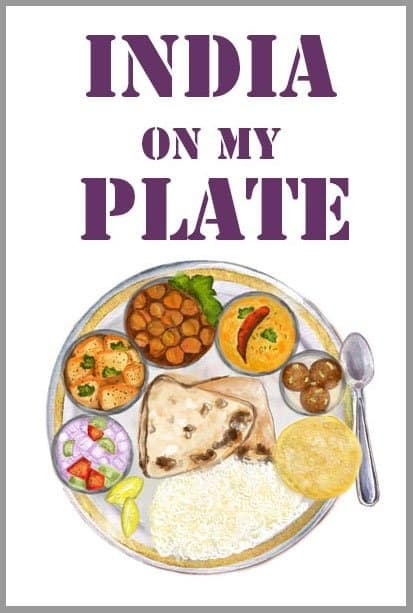 However, the flavors and cooking process of the dish is very similar to Indian curries as well. The shakshuka recipe is easily adaptable to suit the local palettes. How Do You Serve Shakshuka? Traditionally, shakshuka is served with warm pita bread and freshly churned hummus. You can serve it with toasted bread slices, Indian style paratha, or on its own with herb roasted potatoes on the side. Shakshuka is best enjoyed straight from the pan while dipping the fresh bread slices to absorb the flavor of the sauce. This Indian style shakshuka recipe is very similar to that of a curry. Just sauté some onions and tomato in oil and add the tomatoes to this (chopped + pure). At this point, you can also add other vegetables to it like bell peppers if you like. This mix needs to cook till the tomatoes are almost reduced to a rich, saucy blend. The spices are added to the gravy and simmered. Then comes the USP of this breakfast – the egg pockets. Carefully make little pockets or wells in the tomato gravy and crack eggs into it taking good care not to break the yolk. Then cover the lid of the dish and let the eggs cook in steam (while the flame is on medium-low). Once the whites of the eggs are set, your shakshuka is ready to be dished out. Adding a tiny bit of sugar (about half a teaspoon) to the recipe takes away the excess tanginess of the tomatoes and balances out the flavors. The original recipe, however, doesn’t use this. The usual spices used for this dish are paprika, cumin, basil, thyme, garlic, and parsley. Paprika can be substituted with red chili powder, and parsley can be swapped with coriander. Use a sweet oil like cooking olive oil for this dish to get a more authentic, nutty flavor. 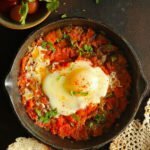 Indian Style Shakshuka Recipe is a delicious twist to the traditional shakshuka. Learn how to make shakshuka Indian style in a few simple steps. Heat olive oil in a cast iron skillet or non-stick pan. Add the onion and fry for 5 minutes. No need to brown them. Add the ginger and garlic paste. Fry till the raw smell wafts away. It will take approximately 1 - 2 minutes. Add the tomatoes, tomato puree, spices, salt, and sugar. Simmer until the tomato mixture begins to reduce, about 5 - 6 minutes. Taste and adjust the seasoning to your liking. Using a wooden spoon, make indentations, or “wells,” in the tomato mixture (make sure the indentations are spaced out). Gently crack an egg into each indention. Reduce the heat, cover the skillet with a lid, and cook on low heat until the egg whites are set. This does not take more than 5 minutes. Uncover and add the fresh coriander leaves. Serve Indian style shakshuka with the toasted bread slices.